A work composed for the Heimatmuseum Reinickendorf, a small museum on the northern perimeter of Berlin, as part of an exhibition entitled "Interventions". This project was censored by the museum, and was never exhibited, despite the support of the project's curator (Dr. Lily Fürstenow-Khositashvili). The intended work consisted of a video, letter, and a proposed extraction. 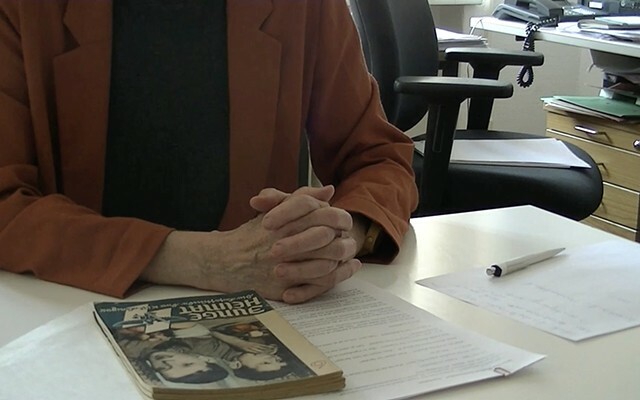 In the video, the museum director Dr. Cornelia Gerner, handles items from the Museum collection that are also artefacts of Nazi presence in Reinickendorf. The camera focuses on Dr. Gerner's hands as she caresses and unwraps each artefact, and we hear her describe how the museum acquired each item, and for what reason the museum feels these items contribute to its collection. 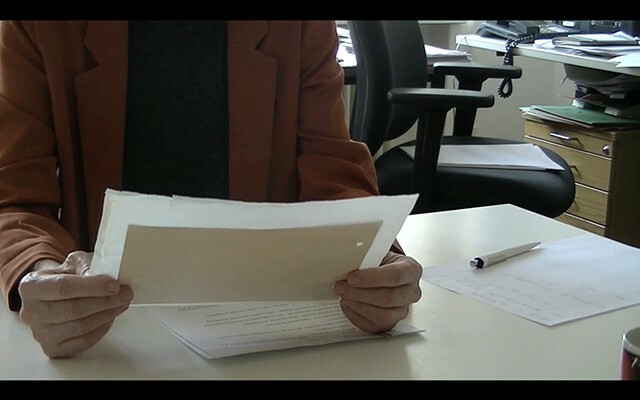 Shortly after recording the video, I composed a letter to Dr. Gerner, which I intended to be exhibited as part of my work. 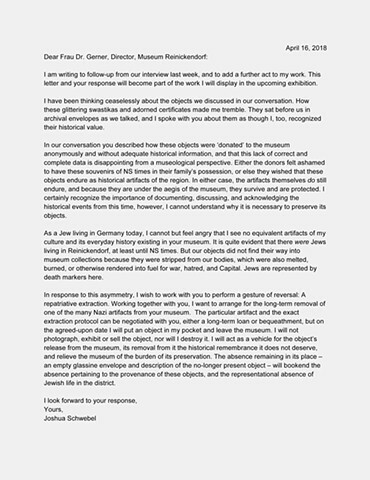 In this letter I criticized the museum's claim to represent the current and hisorical inhabitants of the district, given its collection of Nazi artefacts, and especially with regard to the absence of artefacts of Jewish presence, aside from crude reproductions of markers of their death. In light of this critique, I requested the museum's participation in a reciprocal form of reparation: I wanted to withdraw one of the fascist artefacts from their collection, in order to deny it the respect of preservation, and to reduce the weight of these objects in the museum's holdings. I proposed that the museum could determine the conditions of this extraction, either by longterm loan or gift, and that they could select the object that would be removed. The museum refused this request, and moreover refused to permit my letter to be exhibited. Further, they insisted that the video I had produced also required editing according to their stipulations. 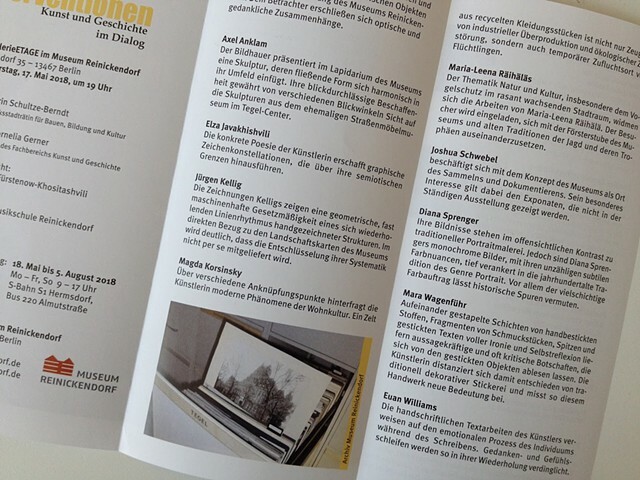 An article on the issue was published in TAZ, a Berlin local newspaper, and an interview between myself and critic Jon Davies was published in MOMUS, an online journal dedicated to art criticism. The museum has forbidden me from making the video public. Despite a signed contract with the museum and having prepared the work, the museum has refused to pay me.